There has been significant debate and research about where, how quickly, and to what degree our forests will shift with the changing climate. These questions have primarily been tackled through modeling (e.g., see Modeling Future Forests bulletin) or studying plant response in the distant past through paleoecology. Quite a bit of uncertainty remains because we do not have complete information about the physiological limits, tolerances, and life history traits of all species, or a good understanding of how changes in relative competiveness will play out (Corlett & Westcott 2013). The paleo record offers us a few examples of vegetation response to abrupt climatic change, but we are generally limited to episodes that were far more gradual than the relatively rapid warming we see today (Williams & Burke in press). There is also the confounding factor of human influence on the landscape, via land use, forest management, wildlife management, introduction of new species, and so on. Given this uncertainty, researchers have used recent observational data to detect early signs of tree species migration and ecosystem shifts. The results have been mixed, as to whether large-scale shifts are underway and whether they are due to climate change. In this bulletin, we highlight a noteworthy new study in the eastern U.S. that shows evidence of significant changes in abundance for a number of tree species. We look at how these results compare with previous research, highlight some overarching themes, and conclude with action items for managers. A recently published study by Fei et al. (2017), entitled Divergence of species responses to climate change, found “prominent westward and poleward shift in abundance for most tree species in the eastern United States during the last 30 years.” The study provides evidence that eastern tree species are responding to recent changes in climate, and the details of their findings highlight the individual responses of different species groups. Researchers used tree abundance data from the U.S. Forest Inventory & Analysis (FIA) program for 86 species/groups in the eastern U.S. They looked at shifts in abundance between two inventory periods: 1980-1995 (depending on the state) and 2015 (the most recent completed year)—with an average window of about 30 years. They analyzed the relationship between observed species shifts and climate (specifically, mean annual temperature (MAT), total annual precipitation (TAP), and Palmer Drought Severity Index (PDSI)), as well as forest succession status. They also looked at whether there were differences in species response depending on functional traits (drought tolerance, wood density, and seed weight) or evolutionary lineage. Vegetation dynamics appear to be a more sensitive to moisture than temperature, at least in the near-term. While the western portion of the study area is drier than the east, it experienced an increase in total annual precipitation over the study period, suggesting that drought tolerant species shifted westward because they could more readily take advantage of the increased moisture. Poleward shifts were more prominent at higher latitudes, where the greatest warming has taken place to date. The stronger trend observed for saplings supports the idea that saplings will respond more quickly to climatic change and exhibit greater sensitivity to drought than adults. Results support the idea that initial changes will be most prominent at species range margins, particularly the leading edge. Gymnosperms have less efficient water transport systems that lead to lower maximum growth rates (compared with angiosperms), so their primarily northward shift may be due to a lack of competitiveness in the drier western region of the study area. Seed size may be an important factor because it is linked to different colonization, tolerance, and competitive strategies used by different species. Higher wood density is often associated with greater survival, which may explain the preferential shift of high wood density species into the droughty (southern) and relatively dry (western) portions of the study area. Non-climatic factors also played a role, including successional processes, forest densification related to fire suppression, and (potentially) infestations (of pests, plants, and pathogens), forest conservation, and plantation efforts. Numerous studies have documented species range shifts that are consistent with what we would expect in a warming world, namely upward shifts in elevation and latitude, for plants and many other types of organisms (Root et al. 2003; Parmesan & Yohe 2003; Parmesan 2006; Chen et al. 2011). For tree species, in particular, these types of elevational or poleward shifts have been previously documented in temperate (Lenoir et al. 2008; Beckage et al. 2008; Woodall et al. 2009; Wright et al. 2016), boreal (Soja et al. 2007), and even tropical (Feeley et al. 2011) biomes. Although, the studies that have detected changes (including Fei et al. 2017) show discernible shifts for only some fraction of species. Not all tree species are responding (yet), and some are responding in ways we might not expect, including instances of downhill shifts (Crimmins et al. 2011) and the expansion of some species into more southerly areas (Woodall et al. 2009). This is due to the complex array of factors that influence where and how tree species will grow, and researchers have cited a number of these to explain the apparent lack of movement or counterintuitive shifts among some species, including competition from established species, changes in moisture availability, adaptation, and so on. In some cases, we also see contradictory results. For example, a 2012 study by Zhu and colleagues examined FIA data for over 90 species in the eastern U.S. and they found that only ~20% of species showed a pattern of northward shift (with close to 60% exhibiting evidence of range contraction) and no apparent relationship between these observed patterns and seed size, dispersal characteristics, or degree of climate change, which is in contrast to the findings of Fei et al. (2017). However, the two studies used different methodologies, which may explain the difference. In fact, the issue of methodology has been pointed to as a partial explanation for the lack of evidence of species shifts to date. Shifts may be happening that our methods can’t sufficiently detect because of challenges with accurately identifying species range margins and data availability across entire species’ distributions (Jump et al. 2009). In fact, previous studies have used a variety of a different approaches to determine whether species are on the move, including comparing the average latitude of tree biomass with the average latitude of seedlings for a given species (Woodall et al. 2009), comparing the 5th and 95th percentile latitudes for seedlings and trees (Zhu et al. 2012), assessing change in the average elevation of recruitment over time (Wright et al. 2016), and others. Fei et al. (2017) is different from many preceding studies in using abundance data throughout the species range, rather than focusing solely on range margins for detecting changes. Will the species become more or less prevalent (in terms of relative abundance)? How will changes in relative competitiveness manifest? Will the species experience growth declines due to less optimal climate conditions and/or a reduced capacity to fend off threats, such as insect infestation? Is the overall species range likely to shift, contract, or expand in the long-term? Two important things managers can do are (1) monitor and (2) promote regeneration. Monitoring includes watching for changes in the forests you manage (e.g. changes in moisture availability or in regeneration success, relative abundance, and/or competitiveness among species) and keeping an eye on the results of large-scale studies like the new research highlighted here. This is especially important in light of the distinct regional differences observed by Fei and colleagues. This will also be an important component of the Resiliency Assessment Framework that is currently under development, which is designed to provide informative metrics for detecting the impacts of climate change on North American forests. Regeneration is the phase when species have the best opportunity to express adaptation to new climate conditions through phenotypic plasticity and it is the mechanism of species migration, so promoting regeneration can be the first step in moving a forest stand toward a condition/composition that may be more resilient in the face of changing climate conditions. Beckage, B., Osborne, B., Gavin, D.G., Pucko, C., Siccama, T., Perkins, T. 2008. 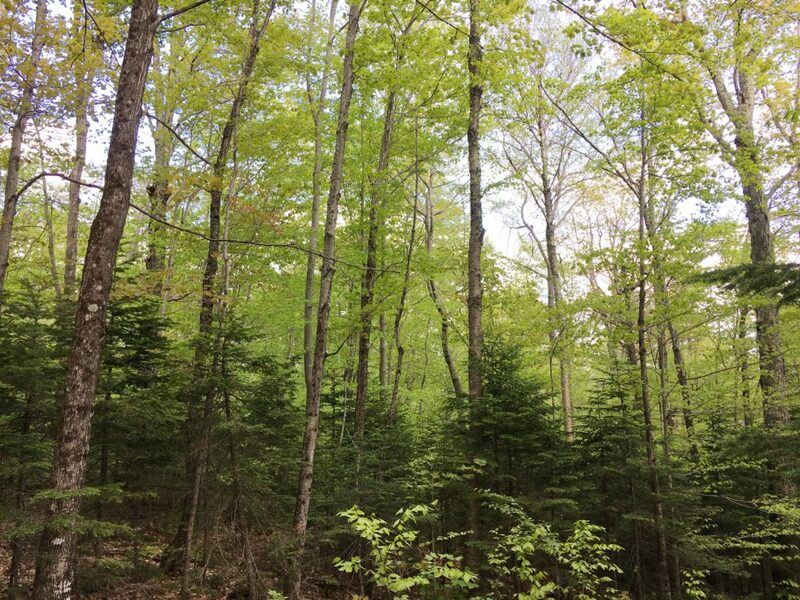 A rapid upward shift of a forest ecotone during 40 years of warming in the Green Mountains of Vermont. PNAS. 105(11): 4197-4202. Chen, I-C., Hill, J.K., Ohlemüller, R., Roy, D.B., Thomas, C.D. 2011. Rapid Range Shifts of Species Associated with High Levels of Climate Warming. Science. 333: 1024-1026. Corlett, R.T., Westcott, D.A. 2013. Will plant movements keep up with climate change? Trends in Ecology & Evolution. 28(8): 482–488. Crimmins, S.M., Dobrowski, S.Z., Greenberg, J.A., Abatzoglou, J.T., Mynsberge, A.R. 2011. Changes in Climatic Water Balance Drive Downhill Shifts in Plant Species’ Optimum Elevations. Science. 331(6015): 324-327. Feeley, K.J., Silman, M.R>, Bush, M.B., Farfan-Rios, W., Cabrera, K.G., Malhi, Y., Meir, P., Salinas, N., Raurau-quisiyupanqui, M.N., Saatchi, S. 2011. Upslope migration of Andean trees. Journal of Biogeography. 38(4): 783-791. Fei, S., Desprez, J.M., Potter, K.M., Jo, I., Knott, J.A., Oswalt, C.M. 2017. Divergence of species responses to climate change. Science Advances. 3: e1603055. Jump, A.S., Mátyás, C., Peñuelas, J. 2009. The altitude-for-latitude disparity in the range retractions of woody species. Trends in Ecology & Evolution. 24(12): 694-701. Lenoir, J., Gégout, J.C., Marquet, P.A., de Ruffray, P., Brisse, H. 2008. A Significant Upward Shift in Plant Species Optimum Elevation During the 20th Century. Science. 320: 1768-1771. Parmesan, C. 2006. Ecological and Evolutionary Responses to Recent Climate Change. Annu. Rev. Ecol. Evol. Syst. 37: 637-669. Parmesan, C., Yohe, G. 2003. A globally coherent fingerprint of climate change impacts across natural systems. Nature. 421: 37-42. Root, T.L., Price, J.T., Hall, K.R., Schneider, S.H., Rosenzweig, C., Pounds, J.A. 2003. Fingerprints of global warming on wild animals and plants. Nature. 421: 57-60. Soja, A.J., Tchebakova, N.M., French, N.H.F., Flannigan, M.D., Shugart, H.H., Stocks, B.J., Sukhinin, A.I., Parfenova, E.I., Chapin III, F.S., Stackhouse Jr., P.W. 2007. Climate-induced Boreal Forest Change: Predictions versus Current Observations. Global and Planetary Change. 56(3-4): 274-296. Woodall, C.W., Oswalt, C.M., Westfall, J.A., Perry, C.H., Nelson, M.D., Finley, A.O. 2009. An indicator of tree migration in forests of the eastern United States. Forest Ecology and Management. 257: 1434-1444. Wright, D.H., Nguyen, C.V., Anderson, S. 2016. Upward shifts in recruitment of high-elevation tree species in the northern Sierra Nevada, California. California Fish and Game. 102(1):17-31. Zhu, K., Woodall, C.W., Clark, J.S. 2012. Failure to migrate: lack of tree range expansion in response to climate change. Global Change Biology. 18: 1042-1052.